1. Combine wheat flour, soya flour, curd, potatoes and salt in a bowl. 2. Mix well to a thick dough. 3. Cover and keep aside for 30 minutes. 4. Heat oil in a nonstick pan. 5. Saute the onions until golden. 6. Add cumin powder, dry mango powder, chilli flakes, coriander leaves and salt. 7. Stir well and remove after a minute. 8. Make small lemon sized balls of the dough. 9. Add a little stuffing and roll the balls into small/medium parathas. 10. Heat a nonstick tawa over medium flame. 11. 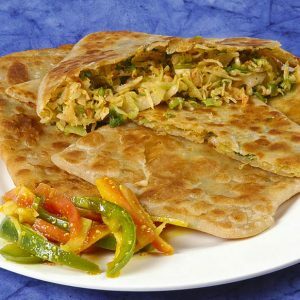 Cook the prepared parathas on both sides until golden. 12. 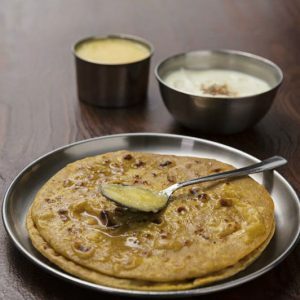 Remove and serve with pickle and raita. 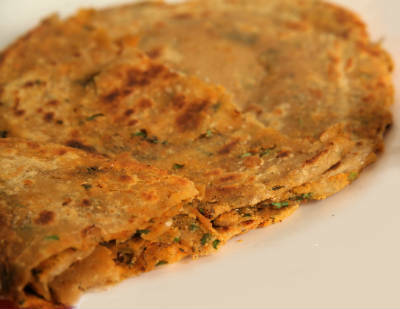 Feel free to comment or share your thoughts on this Masala Paratha Recipe from Awesome Cuisine.